A Raspberry Pi running the latest Raspbian “wheezy” image (at time of writing 2012-09-18-wheezy-raspbian.zip). It should work with other Linux versions too, but that is the one I have tested with. 5. Click OK and after a few moments you should be greeted my your Raspberry Pi's desktop! 6. When you are finished simply log-out from the Pi's desktop. Thanks for the walkthrough. I'll give this a try when I'm home later. What resolution will be used? Can this be changed? Is there a Mac rdp client? Although purists will hate the idea of connecting from a Mac to Linux via Microsoft technology. I was going to include instructions as part of this guide, but for some reason this morning I couldn't get it working on my Mac, so pulled that section in favor of actually getting this posted. But I have had it working in the past. Cord has worked well for us. Daniel - Mine defaulted to full screen. 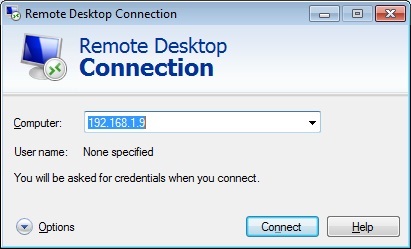 When you enter your IP address if you click the options button, then there is a display tab which let's you change the resolution. I will have to test to see if it works though. Ok, so the resolution is specified by the connecting client, not any LXDE config on the RPi? From my experiments this morning it would appear so, yes. So I can connect from my netbook and get full screen; I can also connect from my laptop which has a bigger display and get full screen. 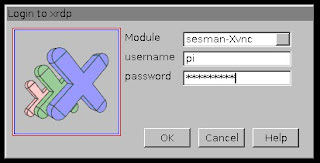 Then changing the resolution on the Remote Desktop Connection settings tab, brought the Pi up in a 640 x 480 window. I get a " connecting to sesman ip 127.0.0.1 port 3350" window that just stays in place until I zap it. Tim - Did you start with a clean Raspbian “wheezy” image or have you got other software already installed on there? What version of Windows are you using? Just given it a go and this works fine thanks. Although don't forget this is Linux, not Windows, so a restart isn't required (I didn't do one). You can find your IP address with ifconfig. Please explain why I need a "clean Image". Am I going to have to wipe out my installs each time I try something new? BTW, the startx still goes to the monitor. Why can't I set DISPLAY=.....? It was just a question... I'm afraid I am no expert on xrdp, I just wanted to share what I had done. My thought was that with a clean image you have the exact same setup on the Pi that I did and if it still doesn't work you can start looking for problems elsewhere. For me the fact I can just wipe back to a clean install is one of my favorite features of the Pi and something I intend to do often. But I guess it depends what you are doing with it. "BTW, the startx still goes to the monitor. Why can't I set DISPLAY=.....?" - I'm not sure what you mean by this bit, sorry. I've disconnected the monitor from my Pi now. Followed this procedure this morning and worked without a flaw. Worth mentioning for newbies like me that Raspian Wheezy includes a running SSHD service. So it's possible to connect from Windows using Putty or Cygwin/OpenSSH to get to a command line prompt - you don't need to purchase a USB keyboard/mouse or attach to a display device. 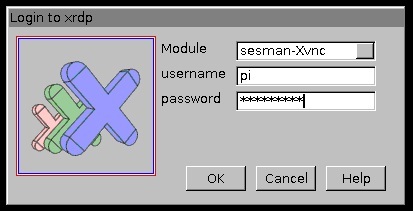 Just use the default username/password of pi/raspberry. thanks for the step by step... it worked! Thanks for the uncomplicated explanation. Thanks you this was helpful. This RDP based solution works a lot better than X-windows tunelling (even compressed) to Xming and displays better than with TightVNC+UltraVNC. I may now think about buying another ARM: Samsung GoogleChrome and connect with RDP to Windows, Mac, RasPI and Linux servers from this light terminal... Need just to be sure that Google will not be archiving all my communications ! I've done everything as you explain, but i´m allways having a "login failed" massage when i try to connect from W7. Any clue? Have you changed the username or password on your Pi? Yes, I did and that was the problem. Finally, I solved it changing it again to raspberry. I tried again and I could connect. After that, I changed it again and now I can connect with the new one. I think that the problem was I changed the password using the raspi-config utility the first time. Second time I did it using a terminal. Thank you for this blog page. Followed the instructions and they worked first time. I just got my Pi working and didn't bother with a separate keyboard and screen. I tried this with Xming but am more familiar with RDP. The downside is I have to install the RDP server. It works a treat. How would I go about uninstalling the RDP server from the Pi? 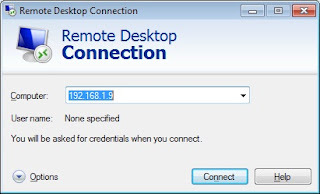 How it is possible to define international or national keyboard when using Windows(7) Remote desktop? Pi seems to use US keyboard mapping as default. I have Finnish keyboard and it works fine when I connect using USB port. I have XBMC installed and it boots into that when i turn on my RPi. Im guessing i need to stop it doing this and instead boot into xrdp (which perhaps explains the fact im getting "no hom/pi/.xsession file" error messages after log in. How do I do this and as my wife uses the RPi for XBMC (and is less teccy than me!) how do I go about reverting back to it booting into that when i need it to? I'm afraid I don't know a great deal about XBMC. Did you install it on top of Rasbian? My personal solution would be buy a second SD card and just put the standard Rasbian image on that. IMHO this is one of the biggest strengths of the Pi, it can actually be multiple computers each with its own specific task and you can switch between them just by changing the SD card. Nice, simple instructional....appreciate it. Worked as written. It is fantastic. Thanks!!! Can i use RJ-45 straight cable between PI and Windows PC ? Ah...thank you!!! So much better to remote in. Just what I needed! If you want to access your Pi from internet , you just have to forward the Port 3389 on your router, to your Raspberry Pi module. When running Scratch through xRDP as soon as a program is run the Pi freezes completely. This happens both with a Windows box and using iRDPAV on an iPad. Mesage on Pi is " Unable to handle kernel paging request..."
* If you click any links to Amazon on this site and buy anything then I will get a commission which will promptly be used to buy more Raspberry Pi accessories. If you don't like that then please don't click the links!